Fructose, sucrose, and glucose are all natural sugars that are found in fresh fruits and vegetables as well as many commercial products. Fructose - (C6H12O6) or fruit sugar, is a simple monosaccharide found in many plants (see images below). Most fructose can be commercially produced as a component of high fructose corn syrup. It is used in food manufacturing because it is cheap and effective as a flavoring and preservative. 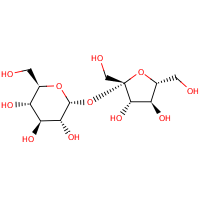 Sucrose (C12H22O11) - is the organic compound commonly known as table sugar and sometimes called saccharose. 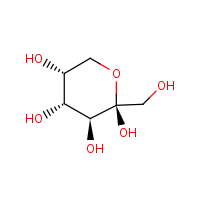 The molecule is a disaccharide composed of the monosaccharides glucose and fructose. NOTE: If some Jmol molecules on this page do not load... simply reload the page. 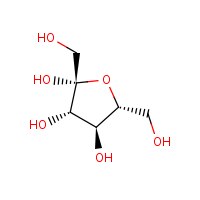 What are the different structures of fructose? Crystalline fructose adopts a cyclic six-membered structure owing to the stability of its hemiketal and internal hydrogen-bonding. This form is formally called D-fructopyranose. In solution, fructose exists as an equilibrium mixture of 70% fructopyranose and about 22% fructofuranose, as well as small amounts of three other forms, including the acyclic structure. In the case of fructose a five member ring can be formed. -- found in crystalline form. The -OH on carbon #5 is converted into the ether linkage to close the ring with carbon #2. This makes a 5 member ring - four carbons and one oxygen. Which is sweeter -- fructose or sucrose? The primary reason that fructose is used commercially in foods and beverages, besides its low cost, is its high relative sweetness. It is the sweetest of all naturally occurring carbohydrates. Fructose is generally regarded as being 1.73 times as sweet as sucrose. However, it is the 5-ring form of fructose that is sweeter; the 6-ring form tastes about the same as usual table sugar. Warming fructose leads to formation of the 6-ring form. Sweetness synergy --Fructose exhibits a sweetness synergy effect when used in combination with other sweeteners. The relative sweetness of fructose blended with sucrose, aspartame, or saccharin is perceived to be greater than the sweetness calculated from individual components. The sweetness of fructose is perceived earlier than that of sucrose or dextrose, and the taste sensation reaches a peak (higher than that of sucrose) and diminishes more quickly than that of sucrose. Fructose can also enhance other flavors in the system. How is fructose and sucrose used by the body? Fructose is one of the three dietary monosaccharides, along with glucose and galactose, that are absorbed directly into the bloodstream during digestion. As sucrose comes into contact with the membrane of the small intestine, the enzyme sucrase catalyzes the cleavage of sucrose to yield one glucose unit and one fructose unit, which are then each absorbed. Free fructose is absorbed directly by the intestine. When fructose is consumed in the form of sucrose, it is digested (broken down) and then absorbed as free fructose. After absorption it enters the hepatic portal vein and is directed toward the liver. Digestion ---Fructose absorption occurs in the small intestine via the GLUT-5 (fructose only) transporter, and the GLUT2 transporter, for which it competes with glucose and galactose. Over-consumption of fructose, inhibition of GLUT2 by other phytochemicals, such as flavonoids, or other issues, may result in unabsorbed fructose being carried into the large intestine, where, like any sugar, it may provide nutrients for the existing gut flora. Because fructose is metabolized in the liver to glucose, fructose has the lowest glycemic index (GI = 19) of all the natural sugars. In comparison, ordinary table sugar (sucrose, which is half fructose) has a GI of 65 and honey (usually about 50% fructose content) has a GI of 55. Due to the potential that excessive consumption of fructose may be a factor in some diseases, including metabolic syndrome and insulin resistance, products containing high contents of fructose may be discouraged. What are the major food types that contain Fructose and Sucrose? Note: For all data above unit of g (gram) are based on 100 g of a food item. The fructose / glucose ratio is calculated by dividing the sum of free fructose plus half sucrose by the sum of free glucose plus half sucrose. What is the difference between fructose found in fruits and vegetables and fructose found in high-fructose corn syrup? The most widely used varieties of high-fructose corn syrup are: HFCS 55 (mostly used in soft drinks), approximately 55% fructose and 42% glucose; and HFCS 42 (used in beverages, processed foods, cereals and baked goods), approximately 42% fructose and 53% glucose. There is no difference in the molecules of sugars found in fruits or HFCS but the soluble fiber in fruit stabilizes blood sugar. How is fructose different than sucrose when cooking of foods? Two reactions take place in cooking that cause browning. They are the Maillard Reaction and Caramelization. Caramelization of sucrose starts with the melting of the sugar at high temperatures followed by foaming (boiling). Sucrose first decomposes into glucose and fructose. This is followed by a condensation step, in which the individual sugars lose water and react with each other. Hundreds of new aromatic compounds are formed having a range of complex flavors. Sucrose and glucose caramelize around 160C (320F) and fructose caramelizes at 110C. (230F). The highest rate of the color development is caused by fructose as caramelization of fructose starts at 110C. Baked goods made from honey or fructose syrup will therefore give a darker color. 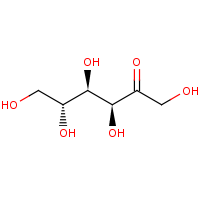 Fructose undergoes the Maillard reaction, non-enzymatic browning, with amino acids. Because fructose exists to a greater extent in the open-chain form than does glucose, the initial stages of the Maillard reaction occurs more rapidly than with glucose. Therefore, fructose potentially may contribute to changes in food palatability, as well as other nutritional effects, such as excessive browning, volume and tenderness reduction during cake preparation. Sucrose – table sugar – is not a reducing sugar and takes no part in the Maillard Reactions (but does get involved in caramelisation). What is fructose malabsorption and fructose intolerance? Fructose malabsorption, formerly named "dietary fructose intolerance," is a digestive disorder in which absorption of fructose is impaired by deficient fructose carriers in the small intestine's enterocytes. This results in an increased concentration of fructose in the entire intestine. Fructose malabsorption is found in up to 30% of the population of Western countries and Africa. This condition is common in patients identified to be suffering symptoms of irritable bowel syndrome, although occurrence in these patients is not higher than occurrence in the normal population. Conversely, patients with fructose malabsorption often fit the profile of those with irritable bowel syndrome. A small proportion of patients with both fructose malabsorption and lactose intolerance also suffer from celiac disease. Fructose malabsorption is not to be confused with hereditary fructose intolerance, a potentially fatal condition in which the liver enzymes that break up fructose are deficient. Why is fructose sweeter than either sucrose or glucose? When sugars bind to taste receptors on the tongue they cause a neural response--this mechanism is similar to how drugs work. Your tongue has sweet receptors. Incoming sweet molecules bind to these receptors, which causes a conformational change in the molecule. This change activates the G-protein, gustducin, which in turn activates adenylate cyclase. Adenylate cyclase catalyzes the conversion of ATP to cAMP. The camp molecule then activates a protein kinase, which in turn phosphorylates and closes a potassium ion channel. The excess potassium ions increase the positive charge within the cell causing voltage-gated calcium ion channels to open, further depolarizing the cell. The increase in calcium ultimately causes neurotransmitter release, which is then received by a primary afferent neuron. The receptor strudture is defined as a class C GPCR that exists asa heterodimer of the T1R2 and T1R3 subunits. The crystal structure has not been solved. A recent theoretical model of sweetness is the multipoint attachment theory, which involves multiple binding sites between a sweetness receptor and a sweet substance. See review article Sweet taste in Man: Review for molecular mechanism of sweetness. Possible dangers in eating cooked fructose. The substance, hydroxymethylfurfural (HMF), forms mainly from heating fructose. Hydroxymethylfurfural (HMF) is the most noted toxin to honey bees. HMF is a natural component in heated food but usually present in low concentrations. The daily intake of HMF may underlie high variations due to individual consumption-patterns. It has been estimated that in a western diet, in the order of magnitude of 5 – 10 mg of HMF are ingested per day from food. Higher quantities of HMF are found naturally in coffee and dried fruit. Several types of roasted coffee contained between 300 – 2900 mg/kg HMF. Chemical and physical properties of fructose. What Sugars Are Naturally Found in Fruits? How safe is fructose for persons with or without diabetes? The heterodimeric sweet taste receptor has multiple potential ligand binding sites.